There were a couple of entertaining games in the Championship Shield on the weekend. Louis Jouffret put in a dazzling display to help Batley Bulldogs ease past a lacklustre leigh Centurions side to win their fifth game running thanks to a 30-16 scoreline at the Leigh Sports Village. Jouffret scored in the 69thminute and his half-back combination with Dom Brambani was impressive. Johnny Campbell bagged a brace and he has scored nine tries in his last four games. Leigh’s Ryan Bailey and Batley’s Lewis Galbraith were sin-binned for fighting in the second half, while Leigh forward Josh Johnson was sent to the sin bin for dissent. 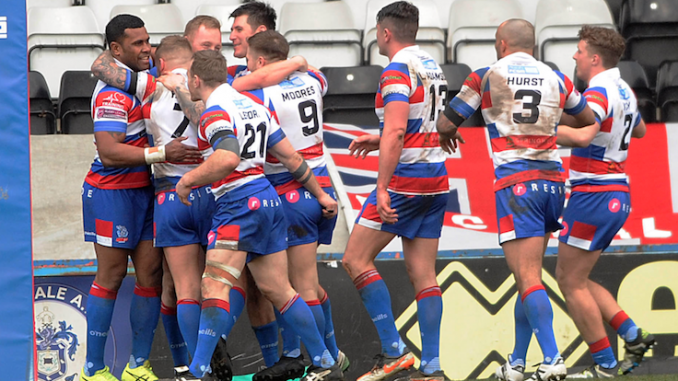 Rochdale Hornets kept their survival hopes alive with a crucial 26-22 victory over Dewsbury Rams at the Crown Oil Arena. Joe Taira, Deon Cross (2), Dec Gregory and Lewis Hatton all scored for the Hornets. Brad Delaney bagged a brace for the Rams. Barrow Raiders won away from home for the first time this season as they edged past Sheffield Eagles 24-22 at the Olympic Legacy Park on Sunday. Brett Carter (2), Ryan Fieldhouse and USA international Ryan Burroughs all crossed the whitewash for Barrow. Josh Toole went over twice for Sheffield. Featherstone Rovers secured home advantage in the Championship Shield final with a 34-18 win against a spirited Swinton Lions side at Heywood Road. Featherstone back-rower John Davies was yellow carded in the first half for a high tackle, while Swinton’s Rob Fairclough and Featherstone’s Misi Taulapapa were sin-binned in the second period for fighting.